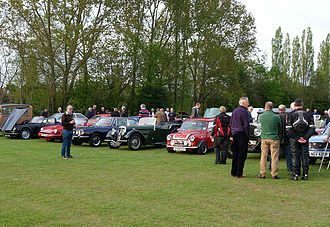 On the first Thursday in the month from 6:00 onwards Classic Car and motorbike rallies have been hosted on the playing fields in front of the clubhouse. These run from April through to October. They have grown to occupy most of the football pitch and are a great way to while away a summer’s evening looking round these great vehicles with a pint in hand (other drinks available too !). Some of the bikes and cars are true classics ranging from BSA or Norton bikes to C-Type Jags, Mustangs or the good old Triumph Vitesse. We’ve even had armoured cars and tractors. We get different vehicles every month. If you have a vehicle that would interest people then come along and show it off, otherwise just come and look !